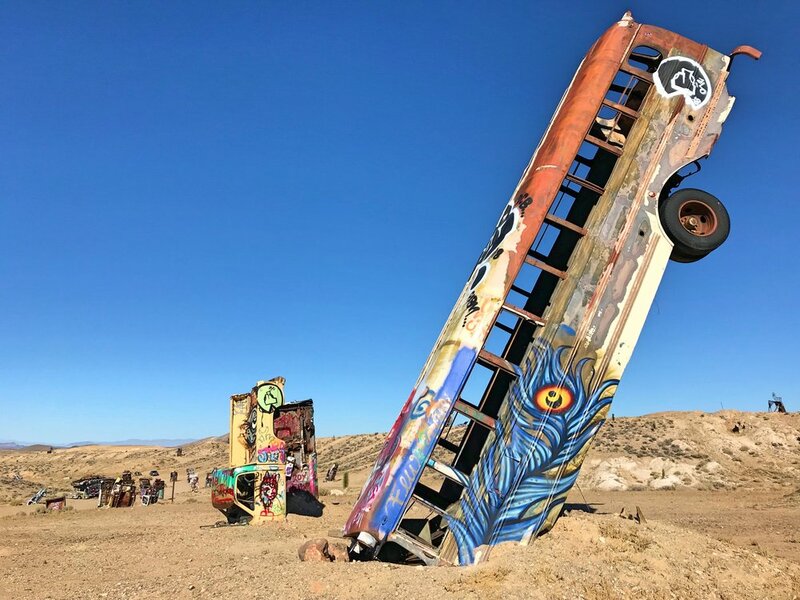 This stacked bus and limo are probably one of the coolest pieces of art in the International Car Forest of the Last Church near Goldfield, Nevada. One of our favorite things to do when we are traveling long miles on lonely highways is to look at our atlas and see what it has listed as “points of interest” along our route. Especially in rural areas, we have often ended up at some really quirky, fun stops. On our way to Death Valley, we stumbled upon two fascinating and strange roadside attractions. One was a ghost town, which was only inhabited for one year, and the other is a somewhat ghostly arrangement of cars buried upright in the ground. 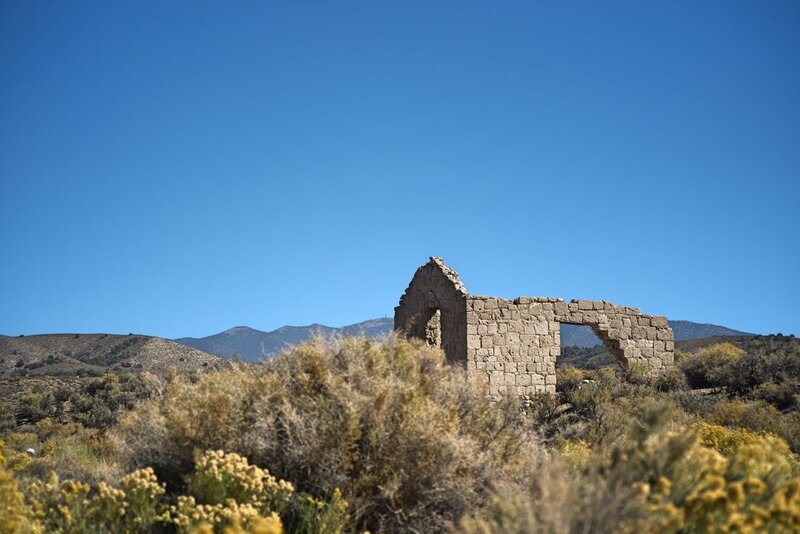 Palmetto Ghost Town is located along Highway 266 in Nevada, very close to the border of California. 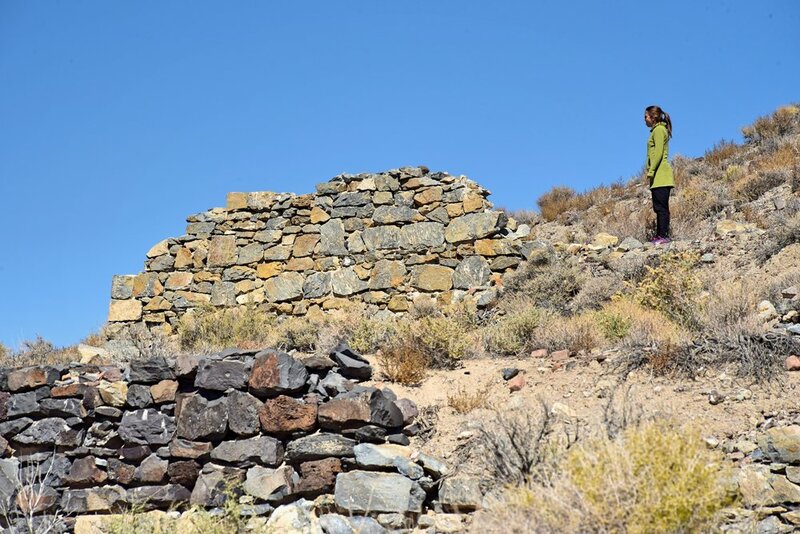 It would be easy to drive right by the ghost town, because most of the ruins are built into a large hill. The old mill remains are built into a hill alongside the highway. The old Palmetto Post Office is the most intact building in Palmetto Ghost Town. The town was founded in 1866, when prospectors discovered silver deposits nearby. The prospectors named the town Palmetto, because they believed the Joshua trees that surrounded the settlement were related to the palmetto tree named the town. But the silver soon ran out and the town was abandoned within a year. In 1906 (coincidentally around the time Rhyolite, the ghost town which we visited in Death Valley, was flourishing), the town briefly experienced a resurgence with 200 tents being put up at the site. Again the town was abandoned within the year. Besides the large tiered mill structure there are the remains of the post office and the stage stop. All that remains of these buildings are a few walls and some piles of stones. The rabbit brush was blooming while we were traveling through this area of Nevada. Ian crawled about 30 feet into the hill! After Palmetto, we noticed the point of interest “International Car Forest” on our map in Goldfield, Nevada. It was about 15 minutes off our route, but how could we resist something so intriguing. When we drove into the town, there were no signs directing us to the site, which is probably the town’s main attraction. Nor are there any signs offering an interpretation or explanation of the art work. The Car Forest is free to visit and explore at your own pace. You just drive through a neighborhood and suddenly you see about 40 vehicles stacked on top of each other and standing on their noses in the desert. Some of the artwork on the cars is really impressive. How did they get that bus like that!? The junked cars are colorfully painted and grafittied. The cars feature typical graffiti images like skulls and tags and colorful graphic shapes and designs. Others have political caricatures or portraits of people on the roofs. One has a painting of Homer Simpson on the hood. Some cars are mosaicked with pieces of computers, toys, and broken glass. The junkyard art is the product of artists Chad Sorg and Mark Rippie. Rippie gave the forest its name because of his opposition to organized religion and his desire for the space to be like a national forest for artists. The cars continue to evolve as new artists add their own work to the cars. There are probably about 40 cars, trucks, and buses sprouting out of the desert at different angles. This art is composed of tons of tiny dots that make the image of this girl. The cars are pretty far apart, and we did a three mile run on the grounds of the artwork. We climbed a high ridge above the installment so that we could get a view of the “forest” from above. We left our van parked below, and we were almost a little worried it would be tagged while we were running! 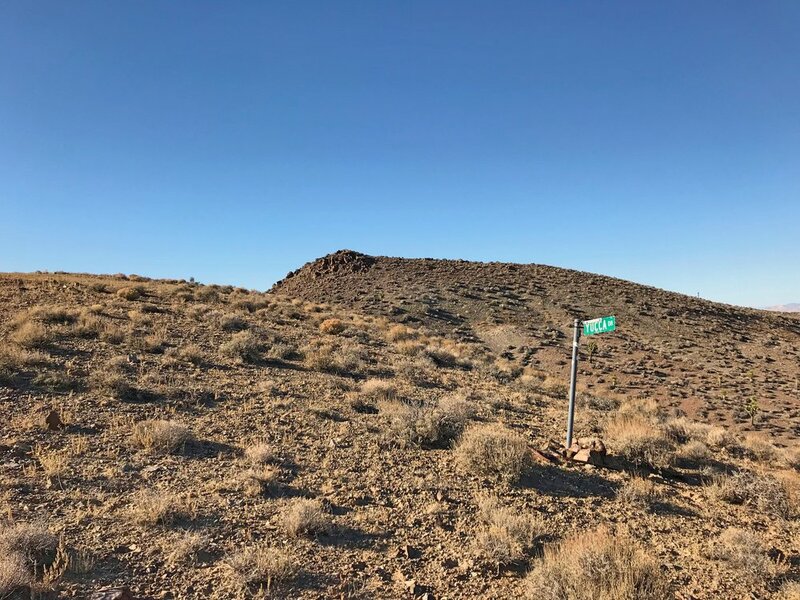 We spotted this random road sign for Yucca Dr. on top of a ridge nowhere close to a road while we were running around the International Car Forest. I was really afraid this bus would fall on our van. We did not leave the van parked here while we were running! Just try and stop us! We spotted this sign somewhere between Palmetto Ghost Town and the International Car Forest of the Last Church.